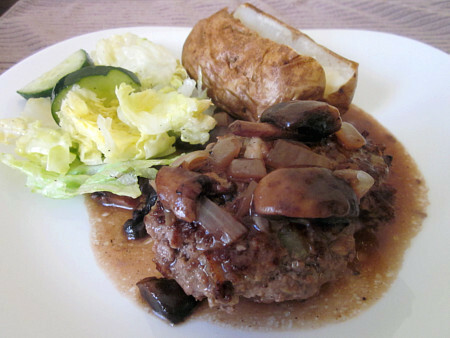 I’ll begin this by saying that I’ve never made salisbury steak before. And the last time I ate it? YEARS ago. Many, many years ago. Of course, it sounded SO delicious when I recently read something about it, you know – since I’m on Weight Watchers and it seems like one of those “taboo” dishes. So I headed over to their site to see if I could find a recipe. Oh boy, did I find a recipe. This was REALLY good! No sacrifice in taste at all. The gravy is perfect to spoon over a baked potato, which is great because then you don’t have to use points on butter or sour cream. Even if you aren’t dieting, try this soon! Combine 1/4 cup onion, pepper, salt, garlic and beef. Shape mixture into 4 (1/2 inch thick) patties. Heat a skillet over medium-high heat. Coat with cooking spray. Add patties and cook for about 3 minutes on each side or until browned. Remove patties. Melt butter in pan. Add mushrooms and saute for 4-5 minutes. Stir in wine and remaining onion, and cook for about 2 minutes. Combine broth and flour. Add to pan and bring to a boil. Cook for about 5 minutes or until thick. Add patties and vinegar to pan, and cook for around 2 minutes. Serve. This entry was posted in beef, freezer friendly, main dishes, make ahead, mushrooms, QuickAndEasy. Bookmark the permalink. Now we’re talking!! I love this! 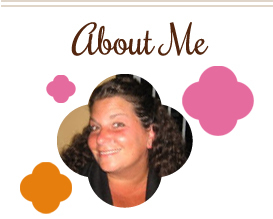 Melissa, I love Salisbury Steak and a tasty ww recipe makes it a perfect meal. Thanks, I love this! I haven’t had salisbury steak in quite a while. It used to be one of my favorite meals growing up. Thanks for the memories. It looks great! That looks like something we’d love. Thanks for sharing! This looks scrumptious. I love steak in any form, so this is great that it has a healthy twist to it!